I decided as a thought experiment to design better rules for Daemon Princes. These guys should be awesome, I mean they proved themselves to be the BEST mortal champions ever and are given one of the rarest blessings from the gods. Yet as many point out (and I had a topic on this a month ago) Princes are "meh"-tier distraction carnifex outside of making a budget bloodthirster with artifacts or something. So I changed that by a few ways. Main points are All Daemon Princes are separate warscrolls. This allows matched play point differentiation rather than try to balance 5 versions with one point level. I haven't pinned down though where a good point level would be for them. 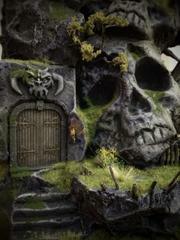 Probably hovering around Dragon Ogor Shaggoth territory give or take 10pts. They lose Monster and Behemoth. This removes a few Monster interactions, allows for Look Out Sir, and lets more behemoths be taken (though thats usually pretty rare for chaos anyways). Up to wounds to 10 and gained a "6" ward save. Cursed Soul Eater becomes Standard. All attacks hit on a 3+. Weapon Choices are now based on damage. Risk a D3 roll or do a flat 2. All are wizards except for Khorne. Their unique spell Chaos Warp Blast gives them some mortal wound punch. Is the double 6 roll too much? I made it mostly for fluff purposes (8 pointed star of chaos). If you do not opt for Wings, you have a 3+ Save instead. Undivided helps with Battleshock. Probably too basic? But he can be the cheapest. Nurgle is tougher with better "ward save" as standard for nurgle daemons and heals more. Tzeentch casts and unbinds 2 spells and can access Lore of Fate (but I didn't want it to access mortal/arcanite items/traits). Slaanesh can pile in farther and is faster when running/charging. Maybe I should keep the "always strikes first" thing? I dunno how Hosts of Slaanesh will change stuff. Maybe he's too fast? Khorne hits more accurately, can dish out mortals wounds, and can flat out ignore spell effects (not just damage). What do you think? So, I've heard some grumbling that the Beastclaw Raiders aren't exactly in the best of spots right now, is that right? Well, I'm here to 'fix' the issue, and when I say fix, I mean post up some concepts I've had to expand the Beastclaw Raiders faction and make it more playable. This isn't actually complete, mind you. It introduces a wizard for the faction, but it doesn't have a 'Lore of the Everwinter' for even more spells, nor does it have new battalion concepts. So have at, and maybe I'll work on it more (unlike my gargants faction...) New Units Everwinter Witch: Everwinter Witches are those women of the Beastclaw Raiders who have communed with the Everwinter itself, learning the deepest secrets of the accursed storm and also learning about magic. Theirs is a simplistic, shamanistic type of magic, reliant on the fickle and wild winds of the Everwinter and barely controlling it at the best of times, but their powers are undeniable. They can read the future by interpreting how dead leaves dance on the wind, or lend their own shrieking cry to drive the Everwinter harder. An Everwinter Witch is a female ogor on foot equipped with a stone knife and staff, both of which she uses in combat. She is a hero, a leader and a wizard. All attacks, be they shooting or melee, targeting her must contend with the winter winds, and suffer -1 To-Hit. Being a wizard, she can cast and unbind one spell a turn, and knows Mystic Shield and Arcane Bolt, in addition to her own innate spell. Her innate spell targets a friendly unit, and for the rest of the turn, when that unit charges, it rolls 3 dice and drops the lowest. If that charge is rerolled, all 3 dice are still rolled for that reroll. Everwinter Witch on Stonehorn: An Everwinter Witch is a figure of immense respect in a Beastclaw Raider tribe. While the Frostlord commands a tribe to the last Ogor, he would be a fool to ignore an Everwinter Witch, particularly one who has tamed a Stonehorn. An Everwinter Witch is a female ogor riding a Stonehorn equipped with a stone knife and a staff. She is a hero, leader, moster, behemoth, and wizard. The Stonehorn keeps its attacks and abilities, and the Everwinter Witch adds in her staff and knife attacks. In addition, the Everwinter Witch gives a free command point during your hero phase so long as your general is a Frostlord on Stonehorn. Being a wizard, the Everwinter Witch can cast and unbind one spell. She knows Mystic Shield, Arcane Bolt, and her own innate spell. Her innate spell lets a unit immediately retreat and lets that unit charge again later in the turn. Everwinter Witch on Thundertusk: An Everwinter Witch is connected to everything that the Beastclaw Raiders embody, particularly their creatures and animals. Riding atop a mighty Thundertusk, an Everwinter Witch can tap into the power over ice and cold that the Thundertusk has and use it for her own ends. An Everwinter Witch is a female ogor riding a Thundertusk equipped with a stone knife and a staff. She is a hero, leader, monster, behemoth, and wizard. The Thundertusk keeps its attacks and abilities, and the Everwinter Witch adds in her staff and knife attacks. Being a wizard, the Everwinter Witch can cast and unbind one spell. However, she gains +1 to her casting and unbinding for every other Thundertusk close by. She knows Mystic Shield, Arcane Bolt, and her own innate spell. Her innate spell targets an enemy unit and, upon a successful cast, deals d3 Mortal wounds to them, plus an addition d3 for every 10 models in that unit as hail comes down upon them. D3 if 5 models, 2d3 if 11, for example. Ogor Scouts: In the harsh Beastclaw Raider society, it is a right to ride a creature into battle, and that right must be earned. 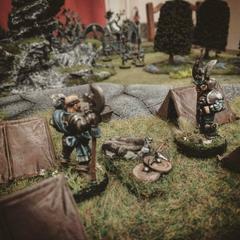 Ogor Scouts, young and untested, hope to prove their worth through battle and providing the rest of the tribe with food. Ogor Scouts are a battleline unit of tribal Ogors equipped with Spears. They can throw those spears for shooting, and use them in melee. Thrown spears gain extra range if the Ogor Scouts ran during movement. They have no other special abilities. Ogor Trackers: When a Beastclaw Ogor proves themselves worthy of a mount, a few choose otherwise. Oftentimes lonesome figures who are called by the wild, Ogor Trackers instead take upon themselves the path of the Hunter. Dedicating themselves to tracking both monsters and armies on the march, Ogor Trackers are part of the vanguard of a Beastclaw army and live the hardest life. Those who survive will become full-fledged Hunters. Ogor Trackers are a unit of tribal ogors equipped with Spears and a Club. They throw the Spears in shooting and attack with the Club in combat. Thrown spears gain extra range if the Ogor Trackers ran during movement. In addition, a unit of Ogor Trackers doesn’t need to be within 1 inch of each other to be in formation, instead being within 3 inches instead. They also have the ability to Track; allied units attacking an enemy unit that an Ogor Tracker is within 6 inches of can rerolled failed to-hit rolls on a charge attack. Great Yhetee: Though the Yhetee are the most loyal of the Beastclaw Raiders’ allies, that isn’t to say they are without mystery. Strange Yhetee driven off by the rest of the pack disappear into the Everwinter, assumed to be lost to the cold chiller than death. Some of them return, but changed into towering, howling behemoths that leap incredible distances. Such terrible monsters are fearsome to have as either enemies or allies, and few Beastclaw Raiders willing work with them. A Great Yhetee is a single model. It is a monster, but not a behemoth and has no Damage Grid. It is a much larger Yhetee covered in frost and ice, and attacks with its claws and teeth. In addition to the Yhetee’s Combat Debuff, 6-inch Pile-in Range and ‘Invigorated By The Blizzard, the Great Yhetee heals d3 wounds in a round that it killed an enemy model and has a universal -1 Bravery radius that affects even its allies. 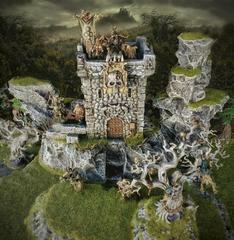 Kits: Everwinter Witch is 1 kit. Contains adaption pieces to let her sit upon a Stonehorn or Thundertusk. Ogor Scouts and Ogor Trackers are 1 kit that lets you build 3 of them. The Great Yhetee is 1 kit, but it’s just 1 model. Here are my ideas for rules to a Krell/Mortarch Kit conversion I'm thinking of. What do you guys think? OP? or Okay? Fan Idea: Collegiate Arcane Battle Mage "Personal Items"
Hi guys, 3 months into the year, and kinda failing at my attempts to make more blog posts. So I've decided to perhaps, focus my efforts on a new blog. 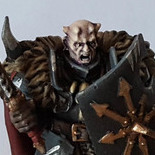 I'm kinda passionate about a lot of the older races, and what can be done to make them more playable in the Age of Sigmar. Games Workshop gives plenty of love of course for those armies that have battletomes and the like, but there's a lot of armies out there that don't get that attention. So that's where I come in! I dabble a bit in creating my own rules, especially when bored at work or something (Shhhhh). I've posted some stuff in the past around the place, but I feel a blog is a good spot to write down my I guess 'designer thoughts' behind the custom rules I've made. 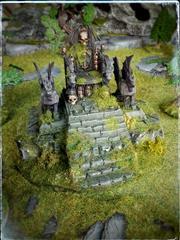 To get started, I thought I'd do a nice an easy one, extra terrain rules! MysteriousLandscapes.pdf I made these rules a while back (and by made, I basically just borrowed terrain rules common across existing types). 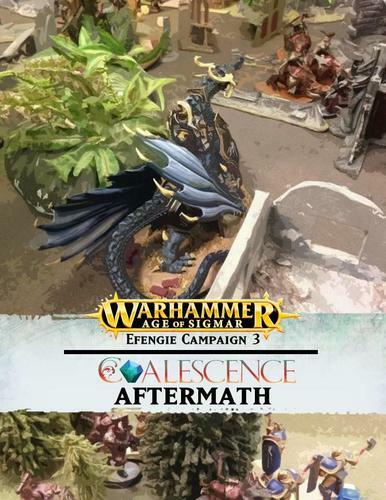 I feel that in Age of Sigmar, there's something missing with terrain. Lots of people complain about the shooting phase and how oppressive it can be (Thanks Skyfires! 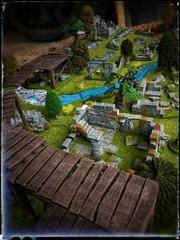 ), and I think part of that is that the core rules only really work of Area terrain. If you've got a building, or some kind of defensible obstacles on the field, well... if they can see you, they can shoot you and without any penalties either! And that's kinda lame! If I'm behind a wall, I should be able to use that wall for defense. Now this is where you go "Well, there are rules for Walls, go pull out that warscroll and use them" and my answer to that is "I shouldn't have to". 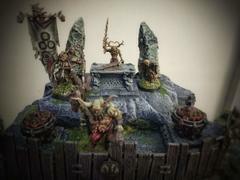 The warscroll approach is great for units, but I feel it's not so great for Terrain. It's a struggle remembering your own warscrolls, what your enemies does, all the fancy allegiance abilities, and all that stuff, without having to remember 10~ additional warscrolls for the terrain on the battlefield at the time. Additionally, Games Workshop do not produce terrain warscrolls for terrain they haven't produce(d). 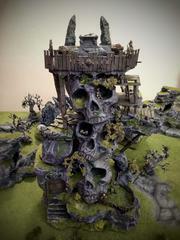 A lot of clubs have their own custom selection of scenery they've built up over the years, ranging from forests, to swamps, to various building and more. What do I do if I have a swamp? Well, luckily the default rules are probably good enough, but then it feels like you're not interacting with the board in a more meaningful manner. So that's where the Mysterious Landscapes document I've tried to create comes in. You can basically boil down terrain to 4 types, area terrain, buildings, defensible terrain and rough terrain. 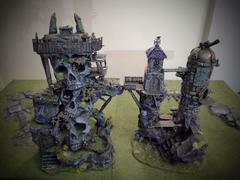 Some pieces like Realmgates and the like I categorize as other, and you just use the regular terrain rules as best as you can. It's a 1 page document that details all the rules of the above as well as the Mysterious Terrain rules from the Age of Sigmar core rules. The intent was, that it can be difficult to remember all the custom rules for the 10 or so different terrain pieces on the board, but if you just need to remember 1 page of details, then it's not quite so daunting. Being a 1 pager, it's easy to print off and have available for you in game. So that's the hope, let me know what you guys think, and hopefully more blog posts to follow on more rules I'm developing.